I come across a couple of cookies recipes, they call for hard-boiled egg yolks only. Interesting. Why someone rather takes the fuss to fix one single ingredient? Isn't it more quick if we use raw yolk, just like most recipes do? It is my thinking: some food is already there and it may go waste if we don't pay attention. Some recipes like this just put it to good use, at least it is my case. I love hard-boiled egg, but still I'd throw out some yolk (for less cholestrol in-take) if I eat more than one egg. See? I have already had the ingredient readily available, no fuss, no being waste. You can use a cookies presser. For me, I just divided the dough into 18 portions, place them on a baking tray, gently press each down a bit to form a disk before create a thrumb print. Bake them for 10 - 12 minutes. Remove them from the tray, and let cool completely on the rack. 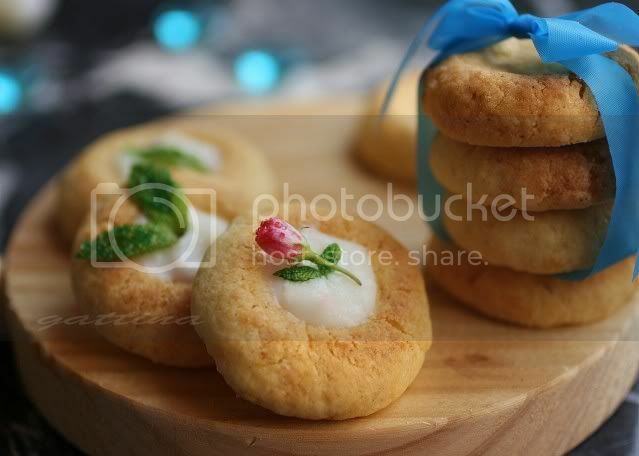 To garnish, I add cream cheese filling, topped with organic edible flowers and mint leaves. Without any garnish/topping, the cookies keep well at least 3 days if keep in a air-tight container. Oh, what precious little cookies! Marvelous! Those are really cute! I love the tiny flowers on top. New to me to use hard-boiled egg yolk in making cookies. But sounds so interesting. Again you had turned something simple to look so delicate and appealing! Can't wait to try it out soon. MMMMMMM...Your cookies loook excellent!!! Yum! Beautiful and perfectly elegant. I don't think I've ever seen a cookie quite like this. 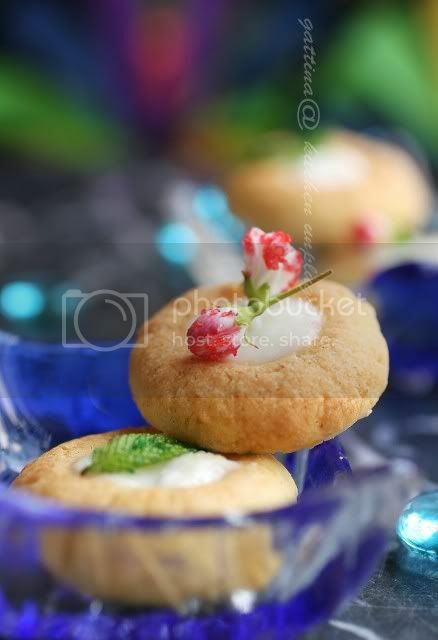 yummy cookies, beautiful presentation and beautiful pics. I love the Danish cookies in the blue tin, who knew that a hard boiled egg would be the key to richness. Yum! Ah the little things that make a mighty difference. Thanks for this one. This is a totally new concept to me, Gattina. How interesting. I love those Danish cookies. I will have to try this. Thanks! I tried this recipe and they're way too crumbly. Go to pick one up and it falls apart. 1. did you use a standard US measuring cup when you measured the flour? 2. was the butter a little too hard (or cold)? 3. did you beat the butter with suguar long enough... the cream mixture got to be very light and fluffy. Looking forwards to your further feedback. Thank you! Just confirming, is it really 4 oz. of butter (approx. 115 gr) for just 1/2 cup of flour (60 gr)? I tried baking these cookies and found them crumbly (like Anonymous' comment). I realized that I was using superfine flour so the next time I will use all purpose flour. The cookie tastes and smells great though. I think 1/2 cup flour is about 4 ozs.